A great place to rest your head! 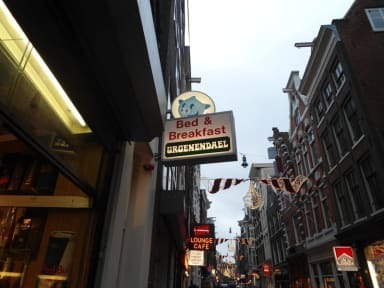 Full of character not extravagant in any way but ticks all of the boxes, 10 minutes from centraal station right in the heart of Dam, literally out of the door you are in the middle of all you may need. Shops cafes bars and attractions all within short walks and transport links with a handy very reasonable supermarket literally seconds away. A basic but more than satisfactory breakfast sets you up for the day the communal showers and toilets clean always. The reception man is really nice. Room Was what you expect from a cheap Amsterdam hostel. Bed was very comfy. Much better than some we have stayed in. Breakfast was cheese bread and a boiled egg. Not much but something before we went out for the day. Good location. 5 min walk from the station and also 5 mins to red light district. Will use again. Pretty good for the price and location. You get what you pay for really just a place to sleep. Great location, wrong room allocated at first but resolved quickly and additional room provided for free. Staff were helpful and pleasant. Bit of an issue on departure with the staff member refusing to return the key deposit back for both the rooms provided which took some time to resolve. 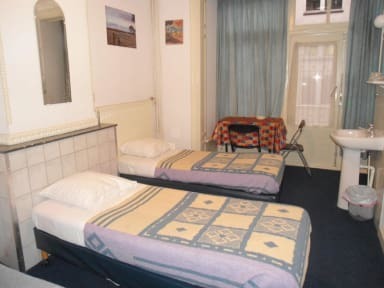 The rooms weren’t nice and never felt comfortable in them really but that’s probably what’s to be expected in a hostel we out all day and night, just using them to sleep and shower. bathroom is vey bad. Quality of brakefast is poor and finally the sleeping bed is very bad. At check in, the guy tried to 'round up' the actual amount we were due to pay. He got irritated when we challenged him but gave in and eventually gave us the change (we had email confirmation). Ensure you know exactly the amount to be paid on arrival! As for cleanliness, blankets don't seem to be washed often enough. We woke up on our first morning to the floor outside our room and bathroom covered in vomit. We informed the staff but even later that night the smell of vomit was horrible. We were really supposed about the 'hole in the wall' that this place was. We wanted to see the room to make sure at it's looks the same at in pictures, but the staff/owner of the place didn't wanna show it and said it looks the same, but reading the comments it didn't seem like. Then we asked to just pay one night but that he could't do and we couldn't pay with credit card he wanted money. We didn't wanna stay there and found a HOTEL for the same price that we stayed for the trip.